Number of discs 24 pcs. 28 pcs. 32 pcs. Our rigid compact disc harrows feature three mounting heights with clevis type lower linkage mountings. The headstock angle can be adjusted and with three top linkage positions. As a result optimum adaptation to any tractor is guaranteed. The compact frame is a trademark of the mounted TERRADISC harrow. Unique open frame design provides a perfect view of both disc gangs from the driver's seat. The first gang of discs is very close to the tractor for a very favourable centre of gravity. Compact, short design guarantees smooth and stable operation of the implement. 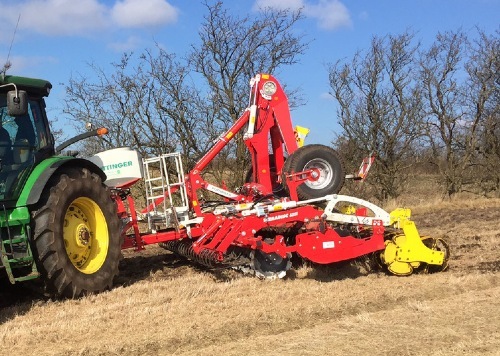 The TERRADISC MULTILINE is a cost/efficient alternative for seed drill with 3 an 4 m working width. It is a trailed soil preparation implement. This means that the load acting on the rear axle of the tractor is minimised. At headlands and during transport, the unit is lifted on the tyre packer. This ensures smooth running, high ground clearance and a low soil compaction at headlands. The scrapers on the rear packer tyres ensure tidy, blockage-free operation of the packer. The scrapers are raised automatically when the machine is lifted. Within just a few minutes, the trailed disc harrow becomes an efficient, fully-functional mulch seed drill. The MULTILINE concept offers arable farmers a wide range of combination possibilities, meeting the demands of the market. 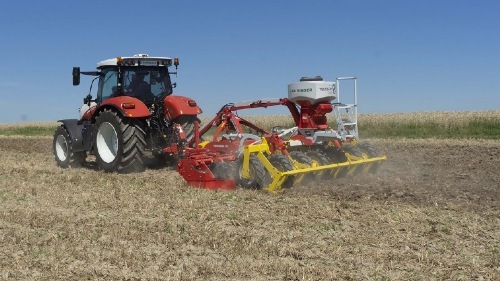 Moreover, trailed TERRADISC models can also be used on their own for seedbed preparation or stubble cultivation. This allows high output to be achieved with smaller tractors. 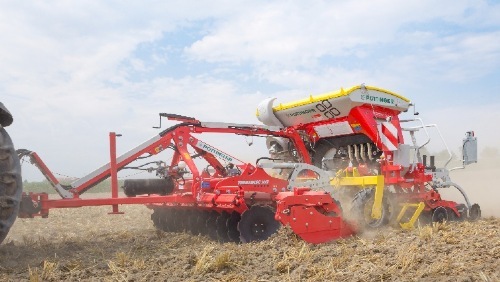 The VITASEM ADD or AEROSEM ADD seed drill is mounted on the packer. This allows the seed drill to be fitted or removed easily - depending on whether the disc harrow is to be used on its own or not. As a result, the MULTILINE combination is a real multi-talent with a wide range of applications. At the headland and during transport, the TERRADISC MULTILINE is lifted by the offset tyre packer so the weight is distributed over the whole working width. The tyre packer ensures excellent handling on the road. The tandem CONOROLL consists of two rollers with bar thickness of 8 mm. The diameter of the rings is 560 mm. Ideally suited to trailed TERRADISC machines. The rollers overlap each other and each has a footprint equal to 50 % of the working width. This is especially well suited to light soil. The inclination of the roller can be quickly adjusted using a lock pin to allow for the working depth and operating conditions. No scrapers required; rollers self-clean effectively. Raised on rear roller at headlands, so there are no problems reversing the machine. A uniform level finish with the best mixing performance meets farmer's and contractor's expectations in the field. To achieve this, PÖTTINGER has optimised the geometry, size, plus both mounting angle and penetration angle of the discs. The result: low draft, perfect penetration, the best tilth and mixing effect, even in dry soil. 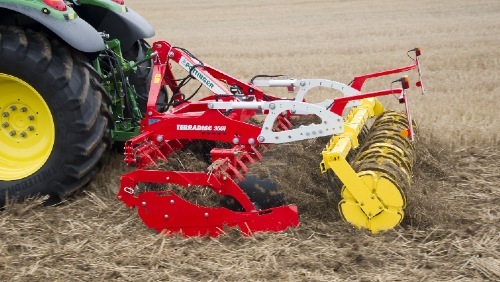 The high tare weight of the TERRADISC also ensures the dependable performance of this disc harrow. Two solid forged carrier arms are welded to a very wide clamping bracket. This ensures that the discs always retain their position and angle. 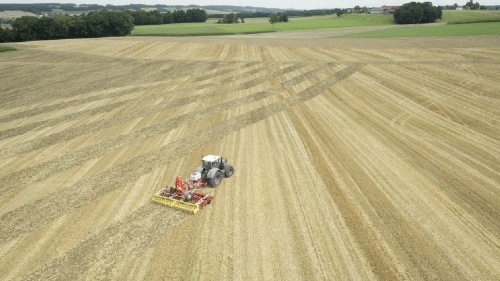 Even in heavy soil it is impossible for them to deviate to the side – hard wheel tracks are broken up consistently. The rugged scalloped discs made of special heat-treated steel have a diameter of 580 mm. Eight discs per metre of working width equate to a spacing of just 12.5 cm. The optimised interplay of ground penetration angle and mounting angle ensure perfect performance. 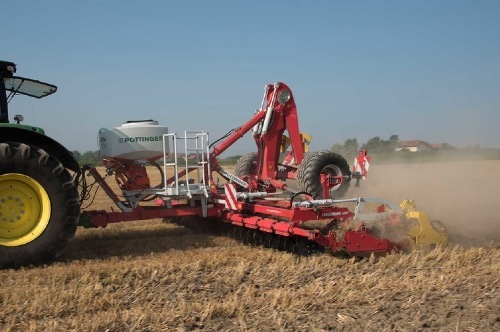 The offset configuration of the aggressive discs mixes harvest residues effectively into the soil. The strong rugged discs made of special heat-treated steel have an optimum diameter. The disc diameter of 580 mm and material thickness of 5 mm ensure a long service life. You benefit from extended replacement intervals as a result. 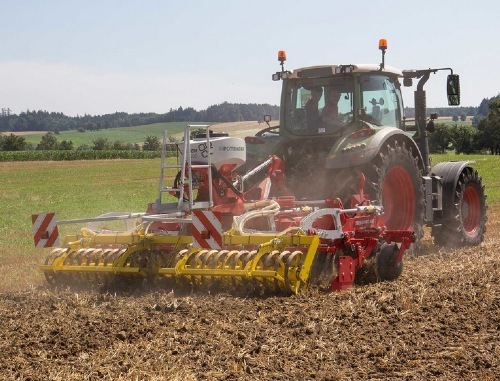 Ideal cultivating results are achieved thanks to optimum spacing of the discs. Plenty of space between discs and carrier arms. The carrier arms are angled facing the direction of rotation so that the risk of stones or harvest trash becoming lodged between the disc and arm is greatly reduced. A large clearance between the disc and clamping bracket means large quantities of organic matter can easily pass through. Fast operating speeds and working depths down to 15 cm mean the disc bearings have to withstand considerable stress. That is why PÖTTINGER has implemented high-quality bearings for an extended service life. This guarantees you trouble-free work even in the most difficult operating conditions. The special twin-race taper bearings have been adopted from the construction machinery industry. Ruggedness and reliability are guaranteed as a result and impacts are absorbed effortlessly. The sealed, twin-race taper bearings are completely maintenance-free. A labyrinth seal provides the best protection for the bearing. The nuts are protected by caps mounted on the same stub shaft. 40 mm thick rubber elements have provided proven, maintenance-free NONSTOP trip leg action for many years. The clamping brackets are mounted on a thick-walled box section frame. Four rubber elements between each wide clamping bracket and the box section provide the discs with high penetration power. On the left and right the outermost concave discs are depth adjustable. This means you achieve perfect merging of passes. 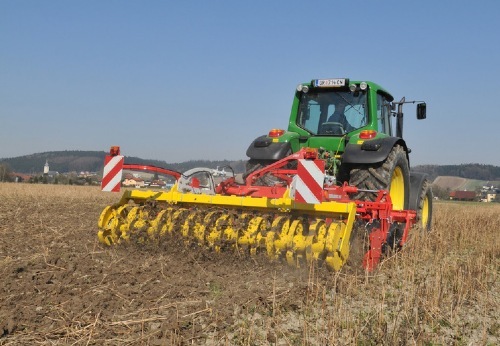 The rear rollers assume the role of depth control for the disc harrow. Working depth is adjusted hydraulically and quickly without risk to the operator. The weight of the roller is transferred to the disc harrow during operation. Thus ensuring reliable penetration on dry and hard ground. Setting up for different soil conditions must be quick and straightforward. 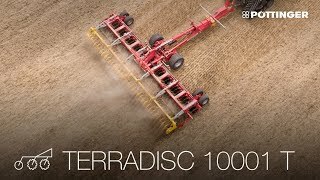 On the TERRADISC compact disc harrow that's conveniently solved with hydraulic depth adjustment. Folding 5 mm-thick swing clips are used to fine-tune depth control. The levelling tines are adjusted in unison with the roller mounting arms. No complicated manual intervention required – convenience that every tractor driver deserves. The outer disc pairs are folded upwards hydraulically for transport on the road. The edging board is simply pushed inwards for transport widths of 3.0 m, 3.50 m and 4.0 m.
The TERRADISC 3501 can be transported on the road unaccompanied in situations where laws permit a width of 11.84' / 3.50 m.
That offers up to 17 % higher output compared to a 9.84' / 3.0 m implement. The optional spring steel levelling tines deflect the flow of soil to the rear roller, crumbling and levelling the ejected mixture of trash and soil. The height of the levelling tines, which are 14 mm thick and feature tangential geometry, is adjusted when the position of the rear roller is changed. The main height and angle settings are preset using a pin-in-hole matrix. The position of the levelling tines changes in accordance with the working depth. The deeper the setting the easier the flow of material to the rear. For a uniform surface finish, adjustable edging boards are provided on both sides as standard equipment. This ensures a neat interface between passes.